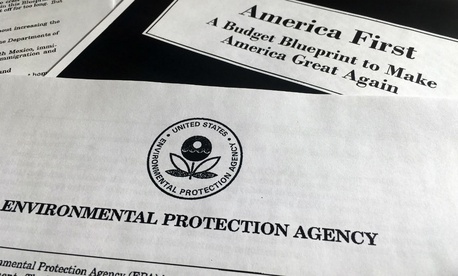 The Environmental Protection Agency will begin offering employees financial incentives to leave the agency this year, according to an internal memorandum obtained by Government Executive. As part of its efforts to meet the requirements of recently issued guidance from the Office of Management and Budget calling on all agencies to restructure themselves and reduce their workforces, EPA will continue a freeze on external hiring and begin offering early retirement and buyouts. Details of the plans were not made clear in the memo, which was sent by acting Deputy Administrator Mike Flynn. He noted only that EPA’s goal was to complete the separation incentive program by Sept. 30, the end of fiscal 2017. Agencies can offer up to $25,000 to employees who have worked in the federal government at least three years through a Voluntary Separation Incentive Payment and allow employees not otherwise eligible for retirement benefits to receive them through Voluntary Early Retirement Authority. The Office of Personnel Management must approve all early out and buyout programs. In its guidance, OMB said OPM would “provide expedited reviews for most [VERA and VSIP] requests within 30 days.” While OMB said it would not prescribe any specific strategy or set reduction targets for individual agencies, President Trump’s fiscal 2018 budget called on the EPA to cut 25 percent of its workforce, amounting to 3,200 employees. The proposal suggested slashing 31 percent of the agency’s budget. EPA has endured significant spending cuts in recent years, with its spending level already reduced more than 20 percent since 2010 and its workforce at its smallest total since 1989. EPA last offered separation incentives to its employees in 2014, targeting mostly regional offices. A recently released inspector general report found EPA paid $11.3 million to get 456 employees to leave the agency that year. Generally, the IG found the incentives “aided workforce restructuring goals,” though it was unclear if EPA had successfully reached its other goals of obtaining staff with new skillsets and increasing the number of staffers per supervisor. When accounting for the additional annual leave payments, EPA doled out a total of $16.2 million in 2014 to separate the employees. The IG noted the agency could not control how many or which employees would voluntarily leave, but that the various EPA offices adequately analyzed their workforce data to determine which positions to target. Under OMB’s guidance, all agencies must come up with both short and long-term plans to reduce their staffing levels, with preliminary plans due June 30. Flynn said EPA has recently formed a workgroup to develop its agency reform plan. EPA is at least the third agency to continue its hiring freeze despite Trump ending it last week. Flynn said the agency will approve “very limited exceptions” to the moratorium and allow certain internal reassignments. “I appreciate your patience as we work through the details of the guidance and will work with you as we move forward,” Flynn said. “Streamlining and reorganizing is good government and important to maximizing taxpayer dollars,” she said. “Any further cuts will absolutely cripple the agency,” O’Grady said. OPM did not immediately respond to requests for further details on the separation incentives.